The Multi-Colour Stroboscopic Bird-Lite chases birds off your property and keeps them away. 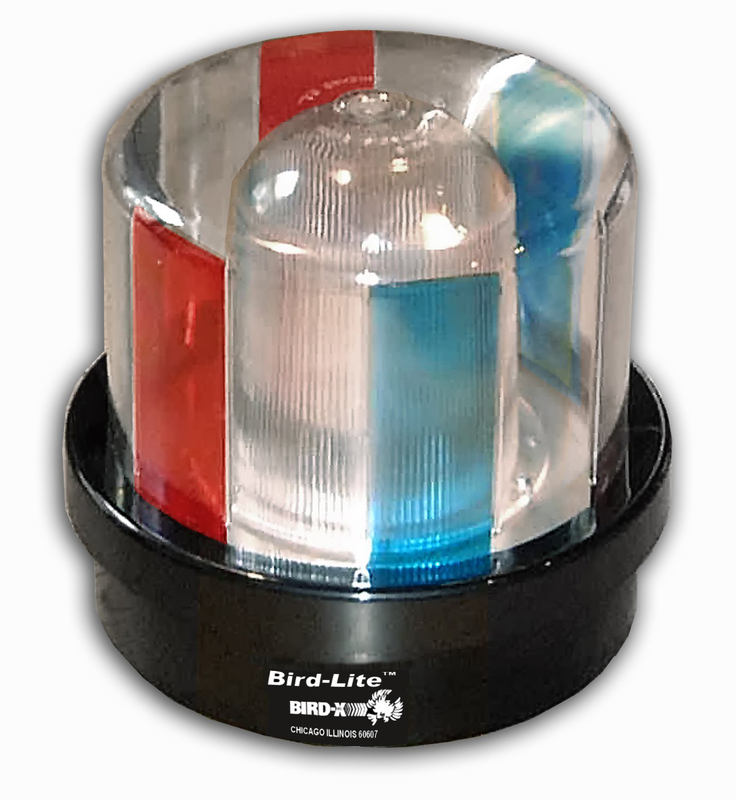 Bird-Lite sends out intimidating and intense light (red, blue and white) at 75 flashes per minute. One-million-candle-power light pulses (and the frightening shadows they create) at this frequency are intolerable and disorienting to pigeons and other bird pests, causing them to fly away from the source of annoyance. When installed at heights where pigeons and other bird pests normally roost, Bird-Lite is barely noticeable to workers at ground level. As it is wired in just like a normal light fixture, you can also hook up a power switch to the circuit to avoid disrupting people, and turn it on when nobody is around. Please note that this unit must be mounted indoors. Cover up to 10,000 square feet per Bird-Lite in factories, warehouses, barns, hangars, granaries or any large, dark or dimly-lit area where birds such as pigeons, sparrows and starlings create a nuisance. Ideal for use in any dark or dimly-lit building where lights and shadows will be most visible and effective. Bird-Lite deters birds with disorienting light, but it doesn't harm them. Customer Satisfaction Guarantee: BirdXCanada offers a 90 day Customer Satisfaction Guarantee on this product less a restocking charge. In certain cases the restocking charge may be adjusted depending on the condition of the product and the amount of time required to restock the product. In cases where the product or its inclusions (including the product box, inclusions, cables, adapters, manuals, etc.) is damaged either cosmetically or functionally, there may be an additional restocking fee (as it will require repair, repackaging, refurbishing or new packaging before it can be sold again). In all cases the customer is responsible for all shipping charges (both on the initial shipment and on the return shipment). The restocking charge is a minimum of 15% if the RMA is requested within 30 days of the invoice date, 25% if the RMA is requested within 60 days, and 50% within 90 days. After 90 days there is no return policy, but there is a 6 months (from purchase date) manufacturer's replacement/repair warranty. Extended warranties are available; inquire if interested. Coverage: up to 10,000 sq. ft.